If there are two things the majority of college students are short on, it’s time and money. 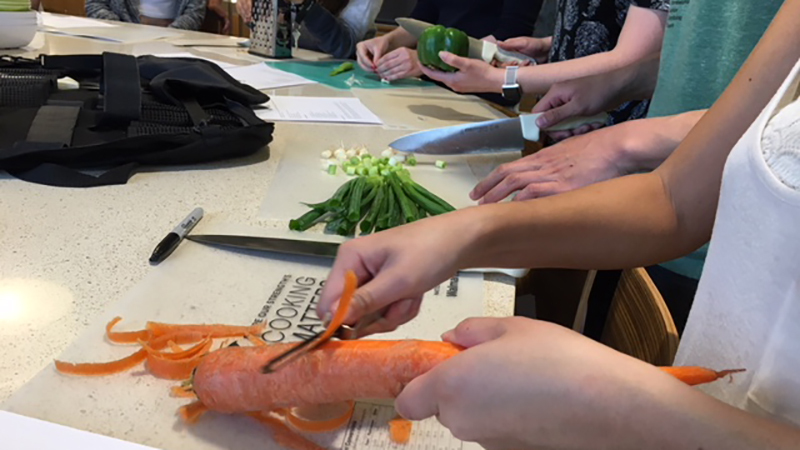 Those two things, combined with the reality that most people today don’t have an abundance of cooking skills, led the Duck Nest to offer UO students something new: a series of classes that teach them the basics of cooking and preparing healthy food on a budget. The Duck Nest — which is primarily geared toward helping students develop self-care and life-balance strategies related to stress, nutrition, physical activity and general wellness — created the free series for those who want to expand their life skills and eat something other than ramen every night. On a recent Tuesday night, seven students gathered in the test kitchen in the Global Scholars Hall, ready to learn how to make chicken fried rice. Before they “knife-up” in the kitchen, however, two student workers from the Duck Nest, both named Ashley, conduct an informational session, covering things like freezing, understanding portions, using the same ingredients for different dishes and producing a balanced meal with protein and carbohydrates. It’s the peer-to-peer format of the classes that really works, Stoysich said. The classes, scheduled every other Tuesday through May, each feature a different approach. Learning to save time and money, for example, is one that often resonates with students. The Duck Nest Facebook page has the current offerings. The next class in the series will be “DIY: Meal Planning” on May 22 from 6-7:30 p.m. at the Global Scholars Hall demo kitchen on the building’s second floor. Students should sign up prior to the event, which they can also do on the Facebook page. The cooking classes have been such a success, Stoysich said, that there are plans to expand the program. “Next year, we'd also like to start leading grocery store tours,” she added.